After the prolonged and destructive Thirty Years War of 1618–48, Europe split into a Catholic south and a Protestant north. The rosary, used to help make sure that prayers were said correctly, was banished from Protestant countries. In the south it was used universally and was commonly worn as an ornament as well as a declaration of Catholic identity. This sumptuous rosary of salmon-pink facetted coral and gold filigree beads probably comes from Spain. Coral was the most popular material for Spanish rosary beads, and the gold filigree is also characteristic of that country. The traditional arrangement of the beads has been altered at the centre. Rosary of gold filigree and coral beads. The beads are arranged traditionally in five decades of ten small barrel-shaped facetted coral beads with gold filigree caps at each end. Between each decade is a matching, slightly larger, Paternoster bead with a small gold filigree bead on each side. At the centre the traditional arrangement has been changed. The final Paternoster bead has been moved down on to the pendant, and three larger beads, which were probably originally on the pendant, have been arranged across the end of the main loop, together with two more small gold filigree beads. Beneath these, at the top of the pendant, is a gold bow with three loops at each side. The crucifix at the end of the pendant is made of gold filigree with a cast body of Christ. 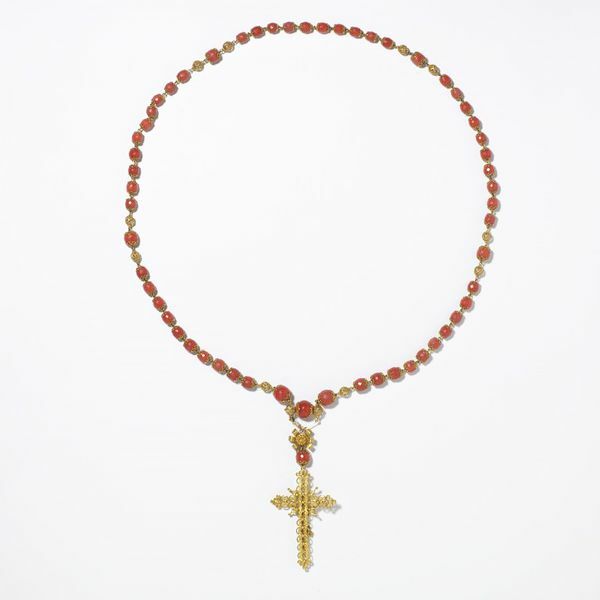 Rosary of gold filigree and facetted coral beads, Spain, 1800-1880.